Location: Sharjah, United Arab Emirates. 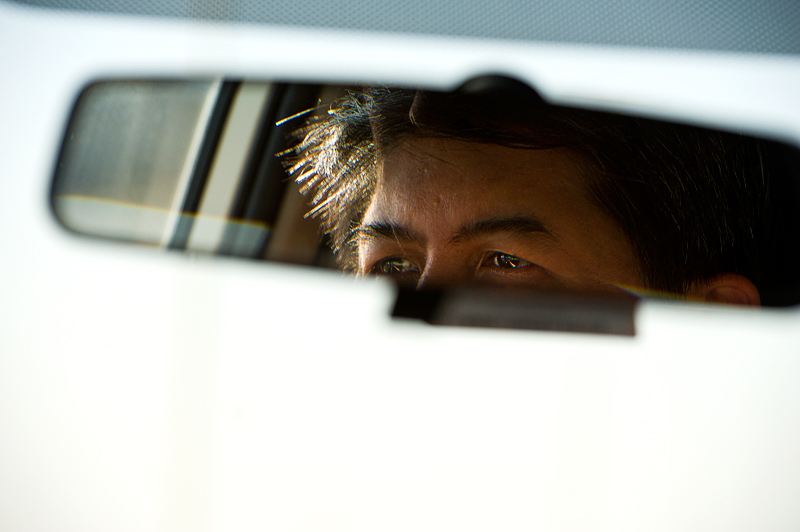 Used a 70-200mm lens to capture my friend Mike's image as we were returning from a morning shoot. Image was taken not complying with the laws of composition to give it an off balance concept. By looking at it much longer, I still do not fall in love with your tones. The lighting on the skin and hair looks fine and the colored diffraction pattern in the eyes is a plus. But most of the surface is this imperfect harsh white, with an ugly yellowish vertical streak. The top right blue-grey triangle just destroys the strong contrast, that's certainly no added value. The mirror gives a nice frame within a frame for the portrait. The eyes are very close to the border, which draws a lot of attention on them and creates a tension in the picture. I guess that is your concept of out of balance. But the mirror itself is placed where you would expect it on a windscreen (they are also always a bit tilted), meaning that the rest of the composition is quite traditional. Therefore I wonder if you did not get some DNMC votes. Sorry for sounding rather negative. I like a lot some of your photos and the way you think about them. If you have questions or remarks about this critique, feel free to contact me. Proudly hosted by Sargasso Networks. Current Server Time: 04/22/2019 07:57:55 PM EDT.